A perfectly-brewed espresso can make nearly anyone’s day. While you can easily grab a cup at a local coffee shop, this can be costly in the long run. Espresso lovers should consider purchasing their own coffee making machine. The high-tech ones can cost thousands of dollars, but there are already models with impressive features that are reasonably priced. If your budget is only $500 and under, then you at the right place. Below are some of the best espresso machines under $500 that you can review and compare. The Capresso EC Pro 118.05 has a state-of-the-art design that will surely make your daily coffee experience memorable. Its pump boiler system and dual filter selections allow you to brew barista-quality coffee. The dual-spout filter is convenient and easy to use, so you can make one or two espresso shots at a time. This machine’s filter comes with a sieve that helps produce perfectly-brewed espresso quickly. However, you need to note that this espresso maker only uses ground coffee. It has a 42-ounce water tank that lets you create a fair number of coffee before it needs to be refilled. The Gaggia Baby features a 15-bar pressure pump, push-button controls, a turbo frother, a portafilter, and a removable reservoir. This espresso machine basically has everything you need to create your favorite brew easily. Its features are even friendly enough for beginners. This machine has the ability to produce two espresso cups at a time. Since it is made of stainless steel, cleaning up will be a breeze. It has a simple and sleek design that snugly fits your counter top and compliments the overall look of your kitchen. This machine is perfect for coffee lovers who want one that is both easy to maintain and utilize. It works great for home use. The Philips Saeco Vienna Plus appears to be heavier and bigger than most models on the list. The good news is that this espresso machine is guaranteed durable to last long and compact enough to fit just about any countertop. This fully-automatic coffee maker works with only a push of the button. It automatically gets as much coffee beans as needed to make your preferred brew, grinds on the spot, and produce your drink right away. It features a 15-bar pressure pump that works double time to extract the most flavor from the beans in the shortest time possible. You are free to adjust the coffee strength and grind through the panels. Furthermore, its 53-ounce water tank allows you to create several servings of coffee before it needs to be refilled. The entire body is made of stainless steel, so cleaning and durability should be the least of your worries. 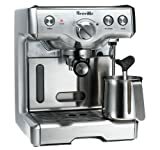 The Breville 800ESXL features a stainless steel housing to ensure its durability. Its construction also makes it easier to clean, and classy to look at. The buttons are simple enough for beginners to understand and use without hassle. Its design allows you to create your preferred brew easily, thanks to its 15-bar pump, dual-wall crema system, and swivel steam wand. Its removable water tank makes cleaning easy. Meanwhile, its Thermoblock heating system allows for quick brewing and prevents steam build up. This machine is perfect for home users, including beginners, especially with its reasonable price tag and high-quality features. The Gaggia Classic is the second largest espresso machine on the list, weighing around 21 pounds and measuring 25” x 13” x 12”. Even though it is on the heavier side, this machine is stylishly narrow in appearance. Its 17.5-bar pressure pump comes with a high voltage boiler and a three-way solenoid valve to ensure a maximum flavor for your espresso shot. With the boiler and valve, the portafilter is removed immediately to make way for the preparation of the next brew. The Classic also features a hot-water dispenser, a combined frother, and a cup warmer to make sure that your coffee is great-tasting. The single- and double-shot filter basket is made of stainless steel, and comes with a coffee tamper and a seven-gram measuring scoop. Best of all, the removable water tank has a 72-ounce capacity, making refilling easy. The Infuser is one of the most well-loved espresso machines on the list. This Breville espresso machine uses high-end technology. Some of them include the PID temperature control, the Thermocoil heating system, and the pre-infusion technology. These features may sound complicated but they are easy to use and help create a consistently perfect espresso shot. Its sleek design makes it easy to maintain and clean. This lightweight coffee maker combines both basic and advanced features to improve your espresso-making experience. Other helpful features include the 1.8-liter detachable water tank, espresso pressure gauge, 54mm stainless steel portafilter, and a hot water outlet. Baristas and coffee lovers will surely thrive with this espresso machine. This machine may not be ideal for beginners, but its features guarantee a great-tasting cup of espresso. It features a capsule system that not all users may like. You simply insert a capsule and your cup of coffee is ready with just a push of the button. No mess to clean afterwards. This machine has DeLonghi’s patented one-touch hot milk technology that heats and froths milk instantly. It has a milk tank that makes it easy for you to store leftover milk for your next espresso. The sliding cup tray is capable of accommodating many cup sizes, while the double boiler system lets you brew and froth at the same time. Its cup warming tray that keeps your cups warm as you prepare. Overall, the DeLonghi EN680.M is definitely a worthy purchase. Choosing the best espresso machine under 500 can be overwhelming if you are faced with top-notch options. In the end, the best coffee maker is one that will perfectly match your personal preference. Consider the choices above carefully and figure out how each would answer your espresso needs. Coffee lovers are constantly looking for the best brew in town. While they can easily grab a cup of their favorite brew from cafes, it is still economical to invest in their own espresso machine. Coffee lovers will surely agree that having their own brewing machine will allow them to freely create their favorite cup at home while saving money. They can tweak the ingredients a bit, and they can even share their brew with friends and family. 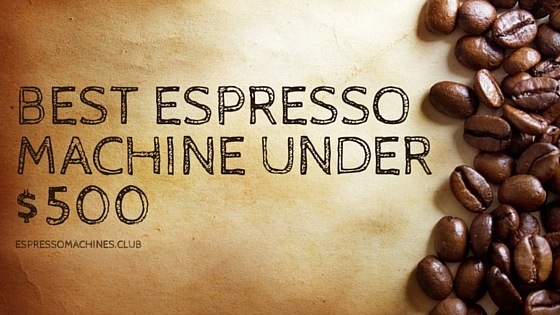 The only question, however, is: how do you find the best espresso machine? Once you know these factors, you can easily narrow down your options and choose the best one for your daily caffeine fix. This is just the tip of the iceberg, though. It is time to move on to the next step: knowing the three major types of espresso machines and what each can offer. Espresso machines of this type feature an electric brewing pump that the user can manually switch on or off. These machines are simple to operate, but involve manual intervention and can be a bit messy. Semi-automatic espresso machines offer brewing flexibility. You are free to use any espresso coffee and adjust the grind fineness, volume, and pressure for your preferred results. In addition, these machines accommodate both ESE-style paper pods and pre-ground espresso. They also require minimal counter space, with some models having a compact design. Super automatic coffee makers are capable of making your brew, from bean to cup, with just the touch of a button. They have a built-in grinder, as well as brewing mechanisms that grind the coffee automatically, process it, and then dump the used grounds in a waste container. Each cycle can take a couple of minutes. Super automatic brewing machines can also froth milk using an automatic frothing mechanism or a steam wand, depending on the model. These machines are easy to use, without requiring any skill or practice. Simply fill up the water, press the button, and wait for your perfectly brewed coffee. The only possible downside is the amount of counter space that it can consume as they are normally bigger than semi-automatic models. Manual coffee makers are often called as old-school brewers. While machines of this type have the ability to create exquisitely brewed espresso, they do require a high level of brewing skill. It means that these espresso machines are best suited for espresso purists who will invest time and effort to experiment. You become part of the brewing process, with determination and mastery necessary for that rewarding experience. They are the most complicated to use, but definitely worth the effort. It is important to note, however, that these machines can only accommodate fine ground coffee. Another good thing about these espresso machines is that they usually only consume minimal counter space. With proper care, manual coffee makers can last for years. Hi, I'm Paul Carabis, coffee lover (ok, maybe coffee addict). I started this website as a way to document the best coffee machines, products and information for personal use and it took off from there! 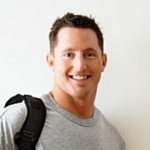 Now I help thousands of readers per month and I trust that I've helped you too! Verismo vs Nespresso: Which You Should Buy & Why (Hint: Price)! Copyright text 2016 by Espresso Machines Club.